This is just to announce my recent interview on CFRU's Pioneer Radio. The show follows roughly the same format as This American Life. Each week they choose a theme which is covered in several acts. In this week's episode, The Powers that Be, I discuss the ways that scientific evidence is understood from the perspectives of industry, environmentalists and First Nations. I love this image from the program. It might remind some field course participants of the last night on Tonquin Beach! Your comments are welcome below! Mainstream Salmon - Could an environmentalist ever approve? Testing water quality outside pens at Mainstream salmon site. Mainstream differs from Creative Salmon, the fish-farm visited earlier in the week, in several key respects. This company raises Atlantic rather than Pacific Salmon. Atlantics grow faster and survive in higher density. They are also more passive in the pen. Overall, their level of domestication affords relative ease in aquiculture. Mainstream is also a much larger corporation than Creative. This is a point of contention for some environmentalists who portray Mainstream as the “evil” foreign company lacking environmental conscience. More on this subject in a moment. Friends of Clayoquot (part 2) - what is the future of environmentalism? I have come to view The Friends of Clayoquot Sound as a case study in the environmental movement at large. This organization is confronting two major changes in the political landscape that have occurred over the past decade. One is the increased involvement of First Nations in industry. The second is the improvements by industries in their environmental practices. In my view, environmentalists have not found a way to adapt to these changes and until they do, their authority and their relevance are under serious threat. Friends of Clayoquot Sound (part 1) - Do trees have rights like people? The Friends of Clayoquot Sound describe themselves as a grassroots, community based environmental organization. Active in this region since 1979, ‘The Friends’ (for short) were major players in the 1990s protests against old growth logging. Currently they focus on three perceived threats to this region: open net fish farming, continued logging of old growth, and the recently proposed copper mine on Catface Mountain. From our perspective, this organization represents a distinctive voice in the ongoing debates over sustainability and economic development. Our aim was to understand The Friends’ vision for the future of Clayoquot Sound and how their goals and activities are justified philosophically. On Tuesday, August 30th we attended a slideshow presented by Dan Lewis and Bonnie Glambeck called The Secrets of ClayoquotSound. The following afternoon we met with Dan, Executive Director of the Friends of Clayoquot Sound, for two hours of lively conversation. Meeting with Dan Lewis outside Friends of Clayouquot office. Ecotrust Canada - The challenges of adaptive management. On Tuesday, September 30th our group met with Satnam Manhas of Ecotrust Canada. Its mission is to promote what they call the "conservation economy". What exactly this means is up for interpretation. Ecotrust Canada's Tofino operations are based in this former fish processing plant. This also happened to be the view from our hostel. Not too shabby! The CBT was founded in 2000 in conjunction with Clayoquot Sound's designation as a UNESCO biosphere reserve. Its mandate is to encourage sustainable interaction with the environment (there's the S-word again). Our group met with Rebecca Hurwitz, managing director of the CBT to discuss how this goal is achieved. I might add that Rebecca was extremely helpful as a local facilitator for this field course - just one example of their activities). I have been attempting to place this organization into the grand scheme of things, as far as local sustainability and development issues are concerned. What sort of organization is the CBT and what is its vision for the future? "Climate change has not been proven therefore it should not be believed." How public misconceptions about science harm the debate about climate change. Scientists (scientific “producers”) and the public (scientific “consumers”) each face a distinctive problem. Producers face the problem of how to know when their theories and experiments are tracking the truth. Consumers face the problem of deciding which scientific “expert” to trust on matters impacting public policy. The standard solution to the producer problem is the (so called) scientific method. 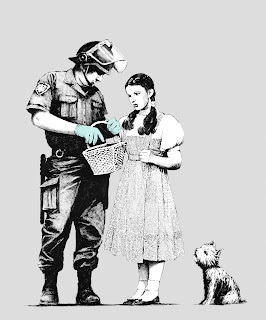 The standard solution to the consumer problem is to base policy decisions on scientific consensus (as much as possible). Dr. Stefan Linquist argues that both the scientific method and the consensus-rule are flawed, and that these misconceptions about science have negative implications for public debates over climate change. (e.g. that it has not been proven and therefore should not be believed). Join us for a short presentation followed by a discussion of these ideas. Thanks to the Clayoquot Biosphere Trust for co-hosting this event, and also for providing support for our group. Here is the CBT blog link to their site. Josie Osborne: Personal relationships in environmental decision making. To cap off what already felt like a full day, we spent Monday afternoon in a second meeting with Josie Osborne at the Tofino Botanical Gardens. Now this is what I call a nice learning environment. Josie explained the importance of developing personal relationships as a way of establishing trust among opposing stakeholders. While this might be true, I see personal relationships as a double-edged sword in small communities like this one. One of Ucluelet's many gems (if I may say so) is the small regional aquarium in the centre of town. Granted, as one of the founding directors of the Ucluelet Aquarium Society, I am slightly biased. But instead of delivering a sales pitch (of course everyone should go there!! ), let me describe how this institution fits into the themes of our course. Here is Laura Griffith-Cochrane doing a predator demonstration for our course. The Sunflower Sea Star (Pycnopodia helianthoides) in front of her is one of the more formidable predators on this coast. Many invertebrates, such as the cockles Laura is holding here, have evolved specialized adaptations for sensing and avoiding these predators. On Monday the 29th of August we rose early and headed to the neighbouring town of Ucluelet (that's "you-clue-let"), approximately 40 km to the south. The contrast between Ukee and Tofino is noteworthy. This town feels more like a coastal fishing village than a tourist destination. There are more family homes in Ukee, more pickup trucks, fewer surfers, and it is harder to find a cappuccino (not that we were complaining). One also senses a certain degree of civic rivalry, as evidenced by the stenciling on these signs marking the crossroads between the two towns- check out the fine print. View from The Junction, where one is presented with the choice between "heaven" and "hell". I don't want to give the impression that our entire visit to Hooksum was consumed only with philosophical discussion. There were some excursions. We kayaked to Cougar Annie's Garden. We hiked to a waterfall. And hung out on the beach, taking it all in. In the evening our group sat around the camp fire, admired the magnificent night sky, and resumed our discussion with Stehphen and Karen. A topic to which the conversation often returned is the meaning of economic development. The promise of economic development is often presented by government and industry as a silver bullet for solving the many social problems confronting First Nations people. Economic development brings jobs and money to these communities. It is in the name of economic development that logging, commercial fishing and aquaculture are introduced to this region. Given the extent of the social problems on some reservations, the development of these industries is generally seen as the only way to move forward. In the writings of some environmental philosophers one occasionally encounters the idea of a place-based ethic. My understanding of this idea is that it identifies as valuable the particular region as such. Two places might be identical in the species of plants and animals that they contain, in their ecological structure, and even perhaps in their beauty. For some, those regions would be of equivalent value. But from a place-based perspective, certain regions possess a value that is necessarily unique to it and which exists in addition to these general features. In Western culture we are somewhat familiar with this concept. Certain locations, such as the site of a historic battle, a famous cathedral, or the home of a famous scientist or artist are valued as what we might call sacred ground. Here Stephen Charleson is reconstructing the system of fish traps that fed his ancestors. Unfortunately, the details about how this system functioned are lost to history. Over the course of our conversations, Stephen Charleson often referred back to the concept of sustainability. As he proceeded to describe his involvement in a series of sustainability planning meetings for Clayoquot Sound, it became apparent how this term acquired a hollow meeting for the First Nations participants. Here is a picture of our group around the table at Hooksum, just up from the beach, talking philosophy with Stephen Charleson. The hillsides, devastated by clearcut logging, provided a sobering backdrop for our discussion. In organizing this field course I was concerned that students encounter First Nations' perspectives on sustainability issues. Prior to European contact the Nuu-Chah-Nulth inhabited Clayoquot sound in the tens of thousands. They lived sustainably in this region for over six thousand years. However, in the last century these communities have been severely reduced, aspects of their culture are lost, and their homeland has been radically transformed. Surely, the remaining members of this culture have acquired views about these changes, and it is these impressions that I hoped we might begin to understand. However, it is not easy for outsiders to gain access to this perspective. For decades, European Canadians representing governments, religious organizations and (more recently) industries have approached indigenous communities with "good intentions". Time and time again, the Nuu-Chah-Nulth have suffered the consequences of these interactions. It is entirely understandable that members of these communities have grown suspicious of outsiders, especially those who show up with lots of questions. On Thursday afternoon, following the meeting with Tim Rundle and a brief lunch, we walked over to the Tofino Botanical Gardens for our meeting with Josie Osborne. Josie is a biologist who has lived in this region for 13 years. She operates the Gardens with her husband George Patterson. In recent years she has worked as a liaison for the provincial government and local First Nations to develop a plan for fish farming. That is a topic to be discussed at a later meeting with Josie. This time, she provided an introduction to local natural history. 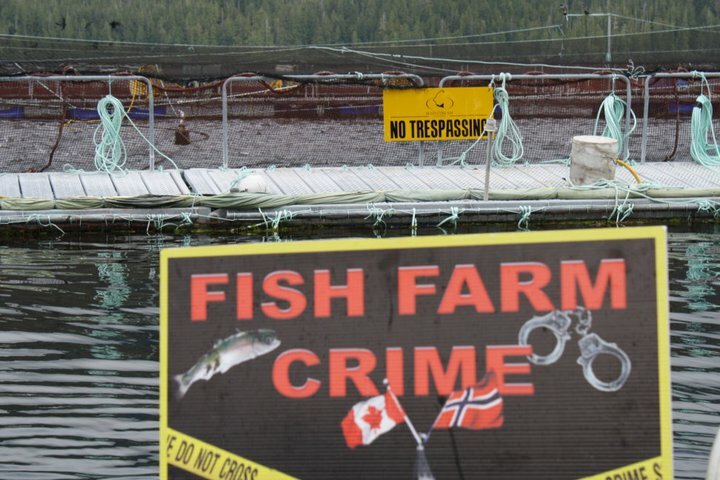 The controversy over wild vs. farmed salmon is familiar to anyone who has spent time in western Canada. For decades, environmental groups have waged a campaign against farmed fish. Due to these efforts the general public has become highly suspicious of farmed fish. 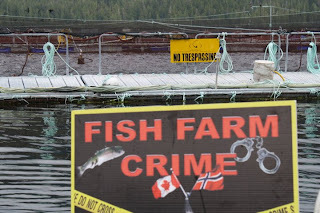 It is generally believed that fish farms are responsible for the release of antibiotics into the ecosystem, the spread of disease to wild stocks, the genetic contamination of local (pacific) salmon, the killing of marine mammals, the destruction of the sea floor, and a variety of other environmental harms. It has reached the point where anyone serving salmon at a dinner party is expected to answer (and justify) whether the fish on the table is wild or farmed. Driving west towards Tofino there is a small section of highway that winds through a patch of old growth forest. The park is aptly named Cathedral Grove. Trees shoot up hundreds of feet from the roadside. They resemble the vaulting arches of a cathedral. Walking through this area one gets a sense of how the Island once looked. The ground is littered with overlapping logs undergoing various stages of decay. Most are covered in moss and ferns. Some older logs, more decayed, are the nutrient systems for younger trees. I am leaving for Vancouver in the morning (in a few hours, actually) and I am just going over the packing. A rain jacket and fleece (or a warm sweatshirt or two) are important because we'll be on the ocean for hours at a time and it can be rainy and windy. In fact I might bring a toque. I have a light pair of pants that dry quickly and some jeans. I'm packing hiking boots and shoes and sandals (possibly overkill). Many socks & underwear. Sunglasses. Shorts. Beach towel. A few T shirts. A decent shirt to wear out. Swimming stuff. If I had a light wetsuit to surf in I would bring it, but I'll rent one there. I'm packing a small stove, pot (for cooking), knife, tent and sleeping mat because I plan to camp on this trip. Everyone will need a sleeping bag. I like to use a pillow and sheet as well. I have a small first aid kit and the pills I take for a bee sting. Toiletry bag with basic stuff. Head lamp. A set of bedtime clothes. That is about it for the main bag. My carry on is a day pack that will come in handy on site. I am packing a few of the small notebooks that I like to write in, a sketchbook, a computer, my ipod. I would bring binoculars but I left them on my boat - damn, too late now. Camera. One novel. Since I have bad luck with airlines losing my luggage a change of clothes will get stuffed into this bag. On my person I have my wallet with ID (drivers license), credit card, and about $300 in cash. I have a printout of my itinerary. I know exactly where I am going when I land, but if I didn't I would print out a map and possibly bus and ferry schedules. I like to have that stuff in print so that I can read it on the plane. Okay that about covers it. For the next week I will be visiting some friends and camping on the Island. Then meeting with the field course participants at Whalers Guest House on August 24th. I will be in contact with the group regarding assignments (or anything else -just email or call) over the next few days, so expect to hear from me. I am really looking forward to this! Can't wait.